While looking into Disney’s planned live-action adaptation of their take on the fairytale classic, Beauty and the Beast (a completely unnecessary endeavor, as their film’s already a masterpiece), I came across another film adaptation of the story that was released unbeknownst to me in France earlier this year. Christophe Gans’ take on the tale is a more faithful take on the source material, while still showing signs of influence from other iterations of the story, such as the 1991 Disney film—with middling results. The events of the story are framed by an undisclosed woman reading a story aloud to two children. I won’t reveal who this woman or the children are, but trust, it’s not exactly a twist when it’s finally revealed. The woman tells the children the tale of a young woman named Belle (Léa Seydoux), the youngest of two sisters and three brothers who are the children of a rich Merchant (played by André Dussollier). Tragedy strikes when the Merchant’s ships sink, and due to some bad business deals, the family loses its fortune. Laughed out of town, the family is forced to settle for a provincial life in the countryside, much to the chagrin of all but Belle, whose selflessness and courage prove to be her only real defining traits. There’s not much to any the characters here save for their cartoonishly bare attributes—which wouldn’t really be much of an issue in, say, an actual cartoon—but even Disney’s take manages to have more complex characterization. On a trip to try and salvage the family fortune, the Merchant, with his eldest son (whose name I cannot recall, and is of little consequence), head to town, where the former finds that said son has somehow gotten into debt with a group of dangerous rogues, including their leader of which being the film’s primary (and extremely trite) antagonist, Louis (Dejan Bucin), and his fortunetelling lover, who serves little purpose other than to deliver obvious/unnecessary foreshadowing. While fleeing Louis’ gang, the Merchant loses his way in the woods, accidentally coming across the castle of the titular Beast. For unexplained reasons, the Beast supplies the Merchant with all of the desires of he and his family, but when the Merchant attempts to claim a rose, the Beast claims the Merchant as prisoner, giving him a short while to bid farewell to his family. This raised the question of if Beast knew that Belle would ultimately opt to take her father’s place (the only way to break his curse). If so, how; and if not, why the drama over a single rose? As previously mentioned, Belle relinquishes her freedom to save her family, spending her days trapped in the Beast’s magical domain, haunted by visions of the monster’s past. But can Belle endure the dangers that lurk behind the doors of the monster’s enchanted domain, and unravel the secrets behind the curse? Obviously so, but the answers don’t make as much sense as you’d hope—even if they are unique ones. 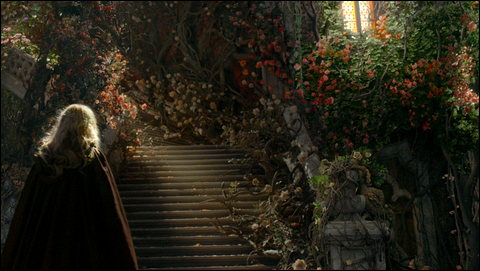 As the events are being told out of a storybook, the film uses appropriate visuals. Transitions are occasionally conveyed through the turn of a page, and the shots are often filled with colors, whimsical effects, and extravagant clothing—even if said effects are obviously green-screen. That being said, most of it is still pretty to look at…but those that aren’t really take you out of the film. For some reason, the filmmakers decided that this adaptation, like Disney’s, also needed cute enchanted companions for the Beast in his home. This film’s companions are little CG dogs that totally standout from the look of the rest of the movie. And as little as they contribute to the narrative, they might as well have been excised from the final product completely. Gans’ version of the tale expands upon Beast’s background as much as it establishes Belle’s. While I’ll choose not to spoil it, suffice to say it raises more questions than it answers. One can appreciate how the movie tried to separate itself from the flood of other takes on the familiar story, but innovative writing isn’t much if it isn’t coupled with a coherent, mature structure to match the “mature” rendition. The incoherence only snowballs as the film rushes from the second act into the peculiarly action-packed third, failing to establish vital elements such as character motivation, why the magic in Beast’s castle works the way it does, or, say, why the titular characters fall in love in the first place. Any Beauty and the Beast story has one job, and that’s it. Believably have the main characters fall in love; but alas, this movie can’t even do that right. You had one job, movie. One job. the antagonist is Perducas, played by Eduardo Noriega !